The holiday season is just around the corner. Can you think of a better way to celebrate the holidays other than with your favourite beer and your closest group of friends? Check out these Alberta beer events to hit up over the holidays! If you love beer and you love networking or you’re just looking for a place to crack a cold one and get in the holiday spirit, visit a holiday beer event! There are tons of Christmas and New Years’ Events in Alberta that will be featuring local beers from Alberta’s breweries. A Wine, Beer and Spirits extravaganza! In this event we will delve into the decant sips of the season from full flavoured, to extravagant. A selection of Alberta breweries have bandied together and have their grievances to air! These brewers have selected the best and brightest of their finest suds to serve to you. Tickets are $30 and include 2 beers and food provided by Paddy’s Barbeque. Additional beers from the participating breweries are $5 each for each can. CRAFT Beer Market is launching their new rotating handles and promoting their Community Brew: Tool Shed Mito Power Beet Beer! Come down and support this great cause on Wednesday, Dec 5th at 5 PM. Tickets are $5 and include 10 x 4oz sample tokens for of our new rotating beers. All proceeds will be donated to Mito Canada. $4 Tool Shed Mito “Energy” Beet Beer all night! $1 from each beer sold is donated directly to Mito Canada. Join us for a joyous & jolly evening to learn a few new cocktail recipes and drink ideas to entertain and cope with visiting relatives and friends this holiday season. We have all your survival tips and tricks to keep you celebrating all season long. The Office Christmas Party is an age-old tradition, but for freelancers, entrepreneurs and smaller companies, we can often miss out on having a proper office party to celebrate the holidays! So Mike Morrison (Mike’s Bloggity Blog) and Kait Kucy (The Archives of Cool) are hosting a holiday office party for all who’d like to celebrate. Whether you work for yourself, a small company, maybe you’re under-employed…or you just want to come to an another office party, all are welcome. The party will take place at Last Best Brewery and Distillery. Your ticket comes with a free pint (18oz) of beer, as well as light appetizers. Our friends at Last Best are also excited to offer us Happy Hour pricing throughout our party, which includes Standard Beer (18oz) for $5, Highballs (1oz) for $5 and $1 off glass pours of wine! The Holiday season is fast approaching and the time for a little indulgence has come. It is the time of year when we seem to revel in the moments of family, friends, feasts and the hedonistic pleasures that come along with filling our bellies. Join us at CO-OP Wine Spirits Beer (Oakridge Location) for a holiday drink tasting! Looking for something to do on New Years in Calgary? Ring in the New Year with our “Best of 2018” Brewmaster’s Dinner & Dance! Choose between a 3 course ($45) or a 4 course ($75) dinner brought to you by your friends as CRAFT Beer Market. Not from Alberta? That’s OK! Check out our events page to find a beer event near you! Join us at Canmore’s Malcolm Hotel for a decadent evening featuring wine, craft beer and whisky tastings with appetizers. Wooden signs are the trend this holiday season! Paint your very own 11×15 wood sign while you enjoy sampling craft beer/mead. Small snacks will also be provided. Edmonton Community Meetup, Powered by Twitch is back with their second annual charity holiday party! Come dressed in your ugliest holiday sweater for a social meetup event for content creators, game developers, industry professionals, and gamers! The event will feature a live stream, playable game demo’s, giveaways, contests, a custom drink menu and more! Our events are free to attend, however if you choose to support the community by purchasing a VIP ticket ($25) you will be granted early access to the venue and a goody bag on arrival. In celebration of Edmonton’s CRAFT Beer Market’s 5 year anniversary, they are throwing a party on Dec. 5th to thank all of you for your support. Join the CRAFT team from 5 – 9PM to enjoy some complimentary appies, cask sampling’s, new rotating draft, live music & more! Time to explore winter beers, from Christmas beers, to coffee beers, to porters and stouts. Anything made for sipping away those long evenings in the winter. With those beers we’ll be serving some wintertime favourites in appetizer form, five in all. Wanting to plan your own holiday beer event?! Whether you’re looking for a family style dinner with friends or a large corporate event for your organization, CRAFT Beer Market has got you covered. Their events team will customize every detail to ensure the most memorable experience for you and your guests. CRAFT offers holiday events packages so you can pick the best “ex-beer-ience” for you and your group! Oops! Did we miss an event in Alberta that you’re attending or hosting? Let us know and we will add it to this list (and our beer events page) to help spread the word! For many of you, your love affair with beer probably started with your father. Here are a couple of beers to enjoy with the old man to thank him for everything he has done for you. What exactly is Cinco de Mayo? What beers are must haves for a Cinco de Mayo celebration? Read on to find out! Whether you live in Canada or are planning a Canadian vacation, these beers are not to be missed. 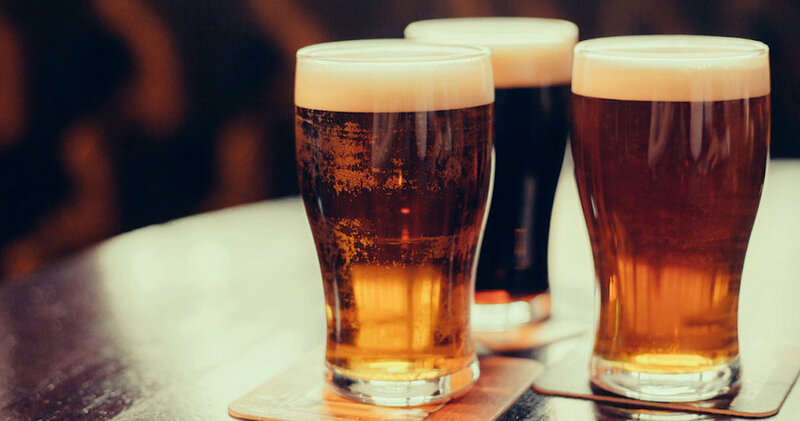 Plan your “beercation” around some great Canadian Beer Festivals or brewery tours and make sure to drink local with these delicious lighter style beers. If you’re just getting into craft beers here are some light flavoured craft brews you definitely want to try. We know you know all about Boxing Day deals… but did you realize that restaurants and bars also do Boxing Day specials and happy hours? Check out this list to learn all the best places to hit up for liquor specials this Boxing Day in Calgary, Alberta! With spring and summer just around the corner, Saisons are the perfect beer to bring in the warm weather. Celebrate National Saison Day by drinking your favourite Saison or Farmhouse Ale with your closest friends. Undecided on a Saison beer? Here’s a list of our 15 favourite Canadian Saisons!